Who doesn't love a good, new-fashioned scavenger hunt? 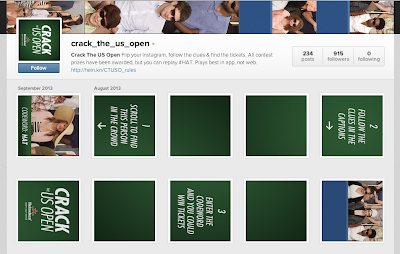 Heineken is using this tactic in a new way to give away tickets to the Men's' Finals in the U.S. Open. Through an instagram account, people can scroll through the profile, turned into a horizontal panorama of the grandstand, to find a series of clues that will eventually lead them to the tickets. Once they find them, they can leave a comment for a chance to win.